So, again, GUADEC was awesome and all. Could be a better experience if I didn't get sick on the way back. Anyway, please link your presentations slides here. Or just fill it in with others. 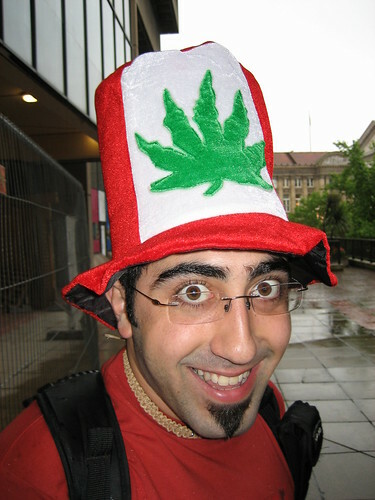 You hijacked my Red Pot Hat while I was out of the party for a walk, discussing future directions of the cairo Xlib backend. I like my hair enough to not want to wear it again. 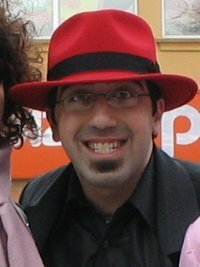 Keep the hat but give me the USB key. Photo of the victim day before got missing. I used to think that it's a problem with gmail that fetching mail over POP3 takes like 10 seconds per mail. Well, it's Evo being stupid and spam-checking each mail before fetching the next one. Turning Evo spam checking off gives me back all my CPU cycles as well as speeding up mail fetching to multiple messages per second. GUADEC is mostly over and I didn't get any chance to blog about it. The vacation week before it in London didn't help either. Anyway, awesome conference, met many people and still many many more to meet. Too many good stuff to list, I'll just link to highlights from Lucas and Vincent instead. 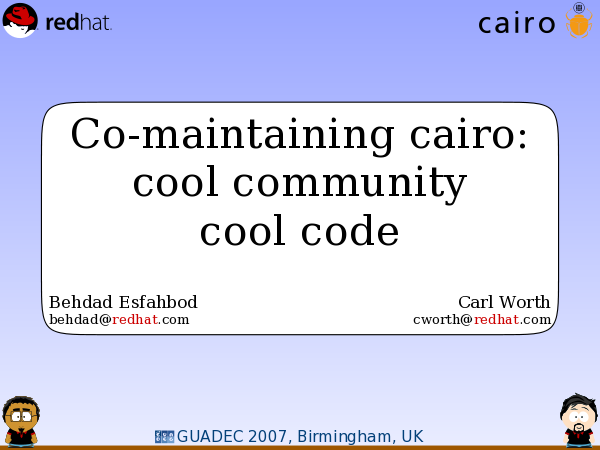 Carl and I talked about cairo code and community. The slides are now available here. In the spirit of cairo talks for the past five years we wrote our own presentation tool. We wanted to be able to be able to have arbitrary cairo drawing in the slides without having to make SVG/PNG out of them first, so we spent 24 hours writing the tool in PyGTK and the final hour before the talk to populate the slides. Anyway, the code is available as a git tree here, or just browse it here. I think it's pretty cool and I'll be polishing and using it for other talks in the future. Have been fun and different, though the party was mellow like Thomas said. Well, 7/7/07 is passed and other than a wedding in Germany I also missed watching Live Earth, Bob Dylan in Toronto, and as I figured out an hour ago, Joan Baez in Wolverhampton. Right, I passed by the venue at lunch time today :(. Good to hang out with Karl Lattimer and Richard Hughes, among others. Entering UK was very smooth except for the hour-long line at passport control. Am on the bus to Stansted airport to catch my RyanAir flight to Glasgow. It's 10am now; Text Layout crew should be almost done with the keynote. Totally missing on all the presentations in the morning :(. Umm, was hacking all the time in the flight. Hope that doesn't ruin the rest of my day. It's just 5am EST. Arrived in aKademy / Text Layout summit at 3pm local time. Scotland is a funny place with it's own details too. Really like to post photos I took on the way but it's too hard right now. It's about 24 hours with no sleep. Am doing Ok though, we'll see. Everyone's here and they were so nice they put all the interesting talks for the afternoon so I'll be here. Thanks you! Quite interesting to meet Eric Mader and Kenichi Handa, attaching faces to names and all that. Also Simon Hausmann (Qt) is here too, so we probably sit down and write a Pango module to use the Qt's HarfBuzz shaper stuff tomorrow instead of going to the BBQ picnic that is in the schedule! I'll write about HarfBuzz in detail later. On another note, Richard Stallman and Bjarne Stroustrup will be talking in Toronto while I'm away :(. Got to go talk. Later.